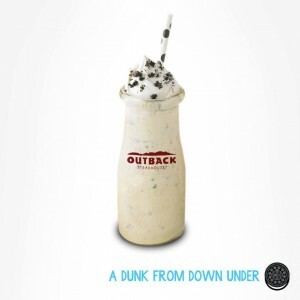 Head over here and submit your information to be emailed a coupon good for a FREE Oreo Mini Milkshake at Outback Steakhouse with any purchase. This offer is valid through July 31 but the coupon expires at a later date. Freebie Details: VALID FOR LUNCH OR DINNER. Expires Wednesday 8/7/13. Valid for Dine-In only at participating Outback Steakhouse® locations in the US. Free Mini Milkshake with any purchase.One coupon per table, per visit. Prices and product participation may vary by location. Not valid in California, Oregon, Washington, Montana, Idaho or Alaska locations. Not valid for No Worries Wednesday Complete Meal For 2, Bloomin’ Mondays, or in conjunction with any other offer or discount.